Hanoi (VNS/VNA) - Analog television signals will be switched off in 15 cities and provinces on August 15, the Ministry of Information and Communications (MIC) said. Deputy Minister Pham Hong Hai on August 10 sent an official announcement to the provincial people’s committees and telecom providers asking them to ensure residents are prepared for the change. These localities are the northern provinces of Quang Ninh, Thai Nguyen, Nam Dinh and Thai Binh, as well as Ninh Binh, Bac Giang, Phu Tho and the southern provinces of Ba Ria-Vung Tau, along with Binh Thuan, Dong Nai, Long An and Ben Tre, in addition to Donh Thap, An Giang and Tien Giang. Accordingly, the provincial television and broadcasting stations and departments of information and communications have been told to increase information on the digitalisation process. It is recommended that viewers get a digital terrestrial television receiver before the analog signal is switched off. The ministry also asked the departments of information and communications to focus on STB support for poor and nearly-poor households in the 15 cities and provinces. According to the management board of the programme to provide public telecom services, more than 479,000 poor and nearly-poor households in the 15 localities would be provided support to install digital terrestrial television receivers. Twelve out of the 15 provinces have basically completed the installation for poor and nearly-poor households. The three remaining provinces of Bac Giang, Thai Nguyen and Quang Ninh will completed the installation before August 15. The provinces have also been asked to inform people about the support switchboard at phone number 1900-1559 and website sohoatruyenhinh.vn. 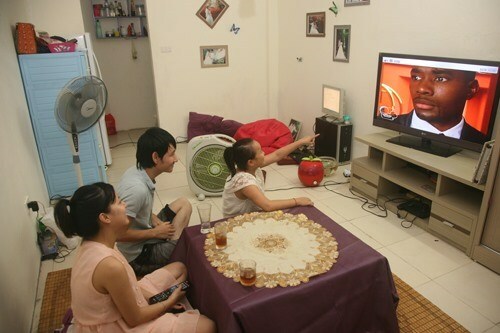 Vietnam is targeting a move to digital terrestrial television broadcasting from analog by 2020 in the entire country as per the roadmap on development of digitalisation of television.